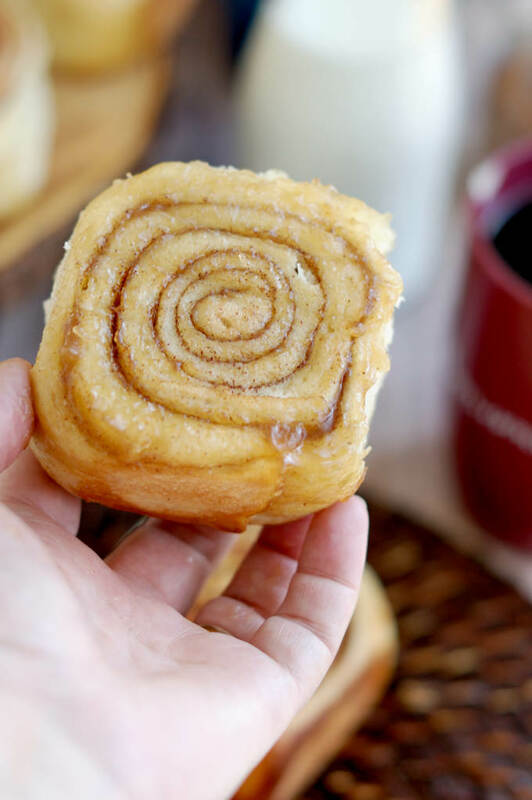 Does anything in the world smell as good as freshly baked Cinnamon Buns? A long, slow rise gives these Sourdough Cinnamon Buns an extra special flavor & texture. Top them with cream cheese frosting for an indulgent breakfast/brunch treat. The buns have a bonus “sticky bun” layer at the bottom. 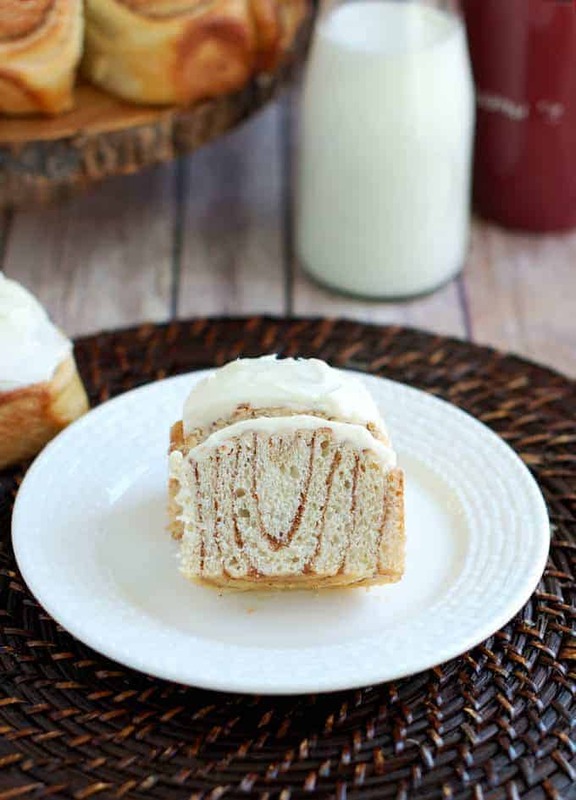 Two things set this recipe apart from other Cinnamon Bun recipes. 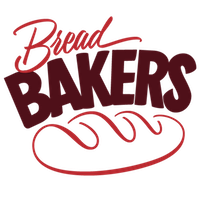 First and foremost, the dough is made with sourdough starter instead of commercial yeast. If you love to bake bread but haven’t delved into the world of sourdough yet, I encourage you to dive-in head first. 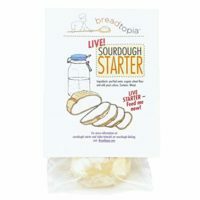 You cannot imagine how a little sourdough starter enhances the taste and texture of any bread recipe. That’s a long-winded way of saying that these Sourdough Cinnamon Buns are extra yummy because of the starter. The other thing that sets this recipe apart is the result of a happy-mistake. Because I wanted lots of cinnamon sugar in the buns, I sprinkled a whole cup of sugar over the dough before rolling it up to form the buns. This is an “overnight” recipe, so the assembled buns spend a night in the refrigerator. That’s great because you can do most of the work the day before and then bake the buns in the morning. 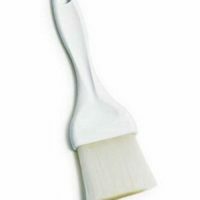 The first time I tested the recipe I found that during the overnight rest in the refrigerator some of the sugar “melted” and formed a syrup at the bottom of the pan. But, hey, you know what? That syrup bakes up to form a sticky, gooey bottom layer on the buns, which is really quite nice. 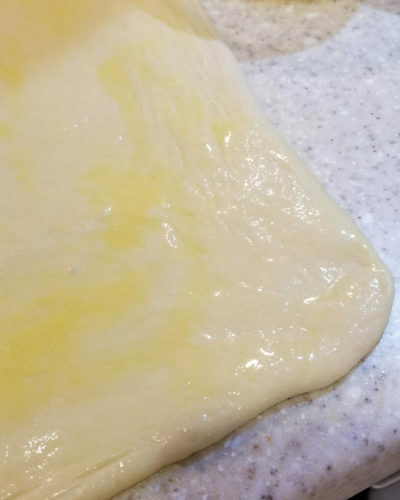 So I embraced the “mistake” and it’s now part of the recipe. The syrup that forms in the pan overnight bakes into a sticky, gooey layer on the bottom of the buns. So it’s kind of a twofer recipe; sticky bun on the bottom and iced cinnamon bun on top. Who’s going to complain about that? Not me! 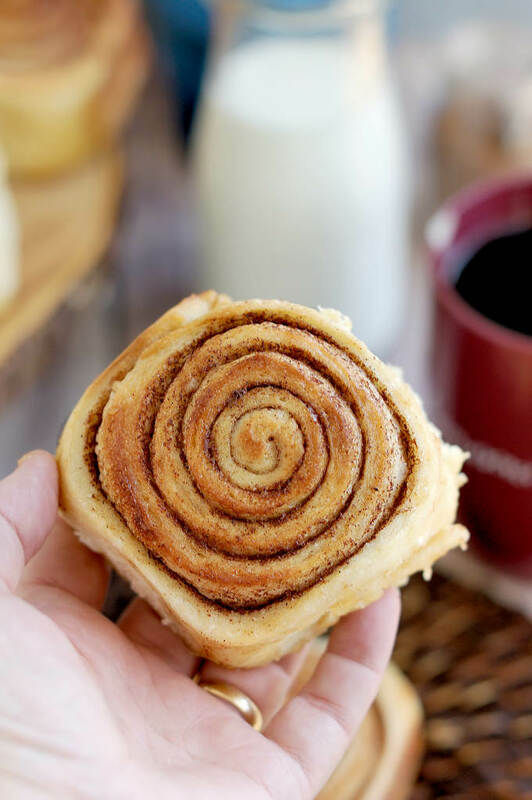 Does anything in the world smell as good as freshly baked Cinnamon Rolls? 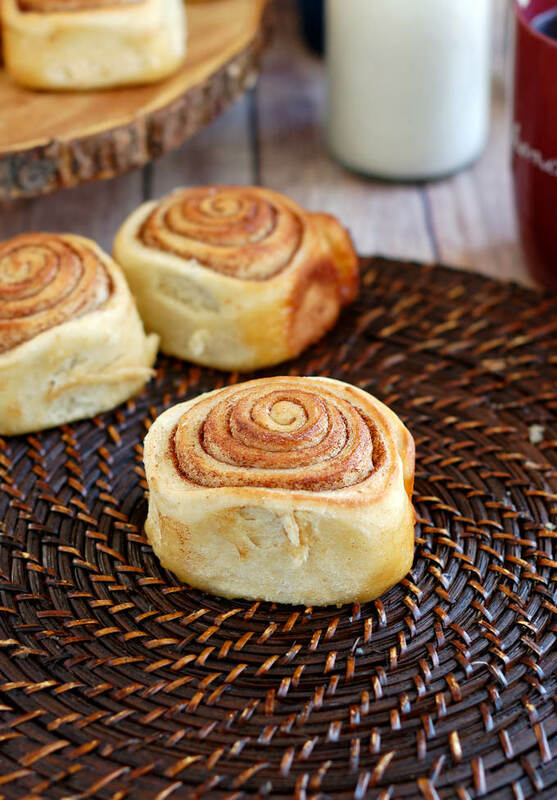 A long slow rise gives these Sourdough Cinnamon Buns an extra special flavor & texture. 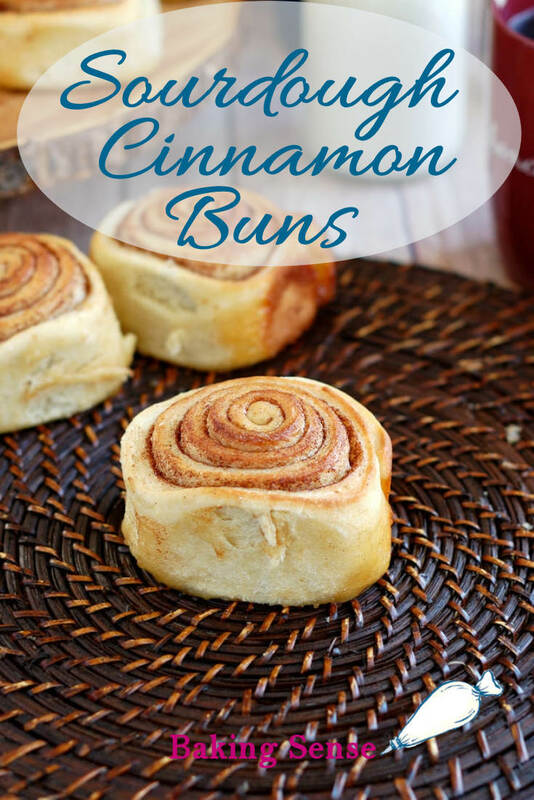 The warm buns are topped with cream cheese frosting for an indulgent breakfast or brunch treat, and there's a bonus "sticky bun" layer at the bottom of the buns. In a mixer bowl combine the starter, water, milk and 2 cups of the flour. Mix to form a thick batter. Cover the bowl and set aside to rise for 30 minutes. Add the sugar, melted butter and egg then mix to combine. 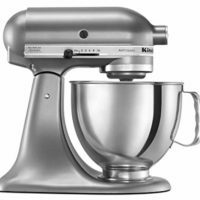 Change to the dough hook if using a stand mixer. With mixer on low add the remaining flour, 1/2 cup at a time. The dough should be soft and elastic, will clear the sides of the bowl and gather on the hook. 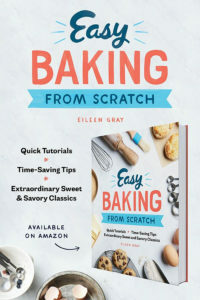 Knead for 2-3 minutes. If mixing by hand continue mixing and then kneading in the flour by hand. Dump the dough onto a lightly floured surface. Knead into a smooth ball. Transfer the dough to a lightly oiled bowl, turning once to coat the dough. Cover the bowl and set it aside at room temperature. After 30 minutes uncover the bowl, lift one side of the dough over into the middle of the dough. Repeat with the other three sides of the dough then flip the dough over. Cover the bowl and after 30 minutes repeat the procedure. Cover the bowl and after 60 minutes repeat the procedure. Cover the bowl and after 60 minutes repeat the procedure one last time (total ferment time is 3 hours). Generously brush a 9” x 13” baking pan with some of the melted butter, reserve the rest. In a small bowl, combine the granulated sugar, brown sugar and cinnamon. Turn the dough onto a floured surface without kneading out the air. 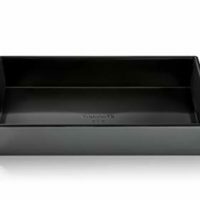 Roll the dough to a 18" x 16" rectangle. 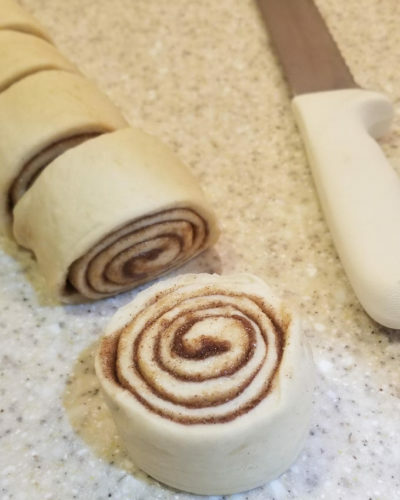 Generously brush the surface of the dough with egg wash. You should use almost 1/2 the egg wash to get a good coating so the cinnamon sugar will stick. Sprinkle the cinnamon sugar over the egg washed dough. 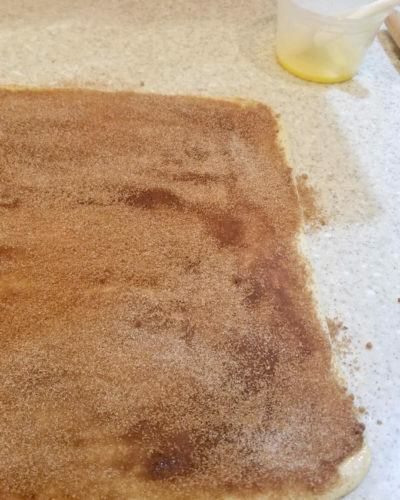 Use your hands to smooth out the cinnamon sugar to an even layer all the way to the edge of the dough. Working from the long side, tightly roll the dough into a log, pinch the seam to seal. Straighten out the log so it's of even thickness and is 18" long (see note 1). 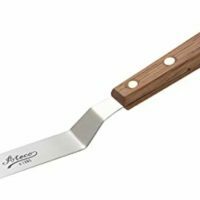 Use a serrated knife to cut the log into twelve 1.5" wide buns. Place the buns in the prepared pan. Generously brush the tops of the buns with the melted butter. Cover the buns with plastic wrap and refrigerate overnight (see note 2). Preheat the oven to 375°F. Bake the buns until they're until golden brown and set in the center, 25-30 minutes. While the buns are baking, make the icing. Combine the butter and sugar in a mixing bowl and cream until well combined. Add the cream cheese and whip until well aerated. Add the vanilla and optional lemon juice. The lemon juice will spark the flavor of the icing but it's ok to go without. Remove the buns from the pan to a serving plate while they are still warm. Spread cream cheese icing generously over the buns and indulge. To work ahead the logs can be wrapped tightly in two layers of plastic wrap. Freeze for up to 3 months. Defrost the dough overnight in the refrigerator, then proceed with the recipe as listed. 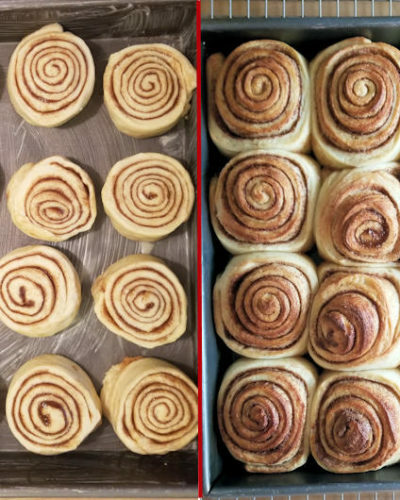 To bake the buns the same day instead of putting the pan in the refrigerator, let the the buns rise at room temperature until they almost fill the pan. Bake as directed. To get the chilled buns active I like to warm them up a bit. Turn on the oven for just a minute or two to get it just a little warm. Turn off the oven then place the pan with the buns in the barely warm oven. Once they're starting to rise remove the pan from the oven. You can then preheat the oven while the buns finish rising. A little sticky bun action on the bottom is a happy surprise! I need to feed my starter and try these. I am literally drooling over those soft, fluffy and delicious cinnamon rolls. Adding sourdough must have made them tangy and delicious. Thanks, Pavani! I’ve got several dozen in the freezer if you want to stop by . I’ve never had much luck with sourdough starter. 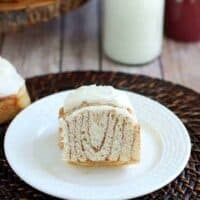 I’m willing to try it again for these rolls! Nothing smells better than cinnamon buns baking! Nothing. Sadly, I just had to throw my sourdough starter out because it had been neglected for so long that it turned on me. 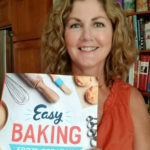 But I am willingly to give it a go again, if only to try your gorgeous overnight buns, Eileen. That sticky bottom! I can’t tell you how many times I’ve brought my starter back from the brink. It’s hard to remember to revive it once it gets shoved to the back of the fridge. They are gorgeous and I can just about smell the cinnamony goodness. 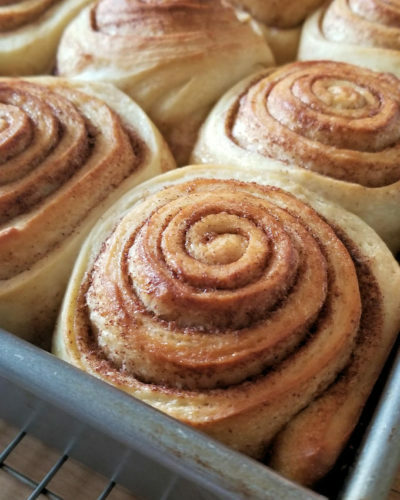 I would love to wake up to these – Perfectly rolled with no spaces! These look so delicious! Cinnamon bakes are so much my weakness I feel like a kid at the bakery / stall that sells these. the sourdough would have lent a deper flavour and texture, Elleen ! gorgeous looking rolls, and perfect with a hot cuppa ! These smell so good, look so stunning.